Peter Hickman made 2018 a year to remember at the Isle of Man TT, winning a sensational Senior race and setting a new outright lap record – the first ever 135mph+ lap of the Mountain Course. Since its launch in 1987, Weise has been involved in the drive to improve rider safety, joining a working group at the ACU (Auto Cycle Union – the governing body of British motorcycle sport), to write a manufacturing guideline for racing suits. In the 1990s Weise was an early adopter of impact protection, made to the newly-introduced CE standard. Today, regular road riders can share in the same race-bred technology and commitment to quality that Peter Hickman relies on, with products like the Weise Corsa RS leather jacket and jeans. 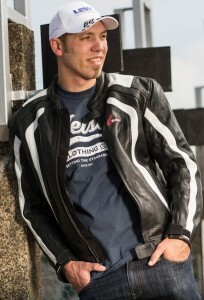 This race-style leather jacket is made from natural milled leather, with CE approved shoulder, elbow and back armour. Stretch panels aid fit and comfort and a removable 120-gram thermal quilted lining allows the wearer to keep riding when the temperature drops. The jacket attaches to the matching Corsa RS jeans with an internal zipper. Produced using 1.2mm-1.4mm leather, with CE approved knee armour and stretch panels to aid movement, these ergonomic sport jeans are available in regular and short leg lengths. The Weise Corsa RS jacket sells for £199.99 and the matching jeans are £179.99. For complete peace of mind, all Weise products are covered by a two-year warranty.